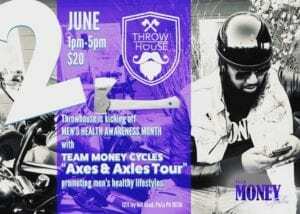 Team Money Cycles and Throw House have partnered to bring you “Axels & Axes”. Get those motorcycles shined and axes sharpened. June is Men’s Health month and what way to celebrate. We will have several speakers discussing the importance on maintaining a healthy lifestyle. We will have health screenings being conducted onsite! All Axe ranges will be open 1pm-5pm and included in your $20.00 ticket purchase. Food and apparel vendors will be onsite to feed those appetites.